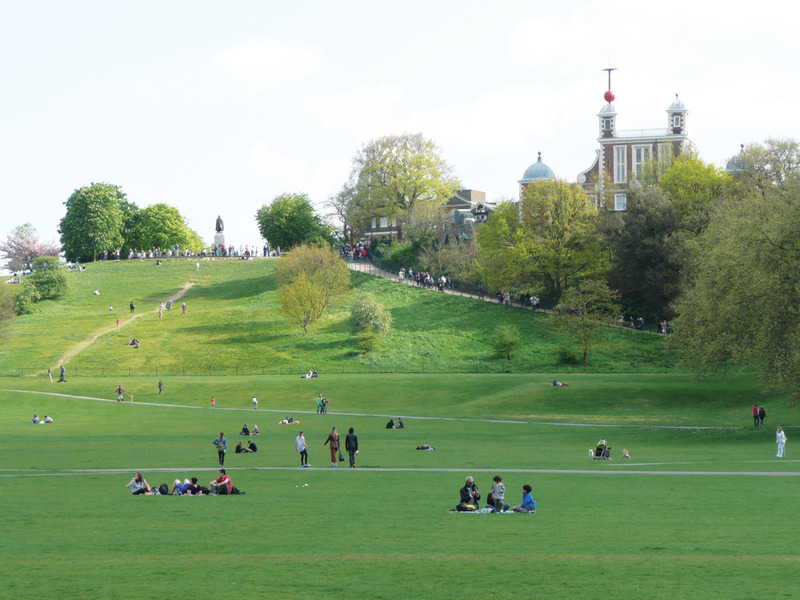 Greenwich has been an important place in the history of England from as far back as the time of the Anglo Saxons. Well known to mariners as the location of the Greenwich meridian, a key factor in maritime navigation, today this UNESCO World Heritage Site attracts visitors for more than the history, science and architecture: the two million visitors each year also come for picnics, music, sports and shopping. The Royal Borough of Greenwich is located on the south bank of the Thames River, about five miles downstream of Tower Bridge and the City of London. It comprises the historic town centre, the Royal Park, Old Royal Naval College, Ranger’s House and three Royal Museums: the Queen’s House, the Royal Observatory, and the National Maritime Museum. 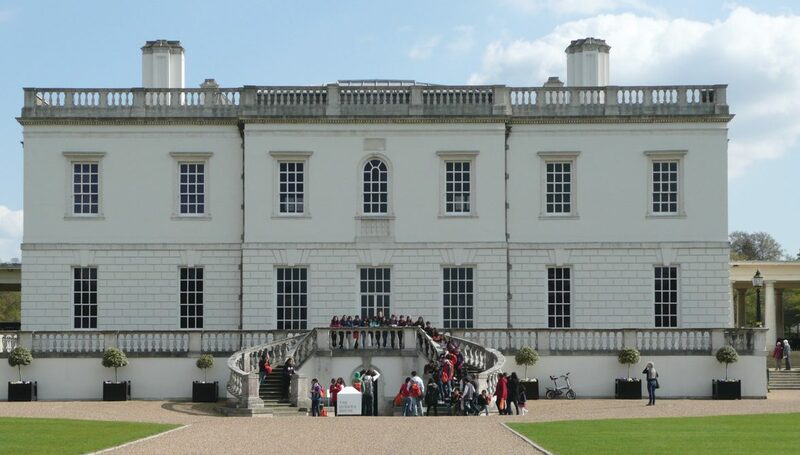 Entrance to the Queen’s House, Astronomy Centre, and Maritime Museum is free. With so much to see, it takes more than a day to fully appreciate it all, so it’s better to plan ahead to make the most of your time. A visit to Greenwich can take many forms, depending on your interests. Long a destination for a day’s outing, the 74 hectare (180 acre) park was the first Royal park in England, made more accessible as a destination by the completion of the first suburban railway in 1838. It is primarily a landscape park, designed in the eighteenth century, with tree-lined paths and lots of open space, making it a beautiful place to walk or picnic. Ascending the path leading up the terraced hill to the observatory brings into view the impressive vista. 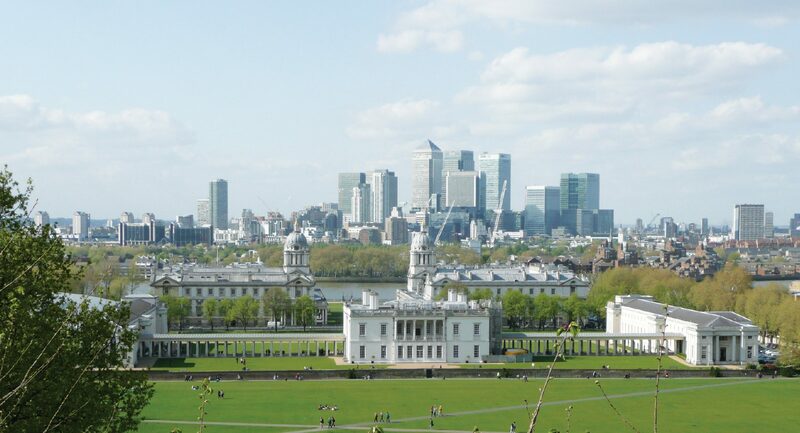 It runs across the park, past the Queen’s House and the Old Royal Naval College, down to where the grounds border the river at the Greenwich pier, and across the distinctive city skyline. This scene has been captured by many artists over time. If your tastes lean toward architecture and art then there is a lot for you to see. For example, standing upon the site of the former fourteenth century Tudor Palace, the birthplace of Henry VIII and Elizabeth I, is a building that has been described as “the finest piece of monumental classical architecture in England.” King Charles II had the palace demolished, and over the period 1696 to 1751, successive royals replaced it with the Royal Hospital for Seamen, built to the designs of Sir Christopher Wren and Nicholas Hawksmoor. Its use as a hospital to house “pensioners” from the Royal Navy gave way to the Royal Navy College from 1873 to 1998. In 1824 a primary feature of the Royal Hospital, the famous Painted Hall, featuring the baroque masterpiece by Sir James Thornhill, became the National Gallery of Naval Art, the first national historical gallery, housing over 300 paintings. By 1936 the Greenwich Hospital Collection had been moved to the new National Maritime Museum. 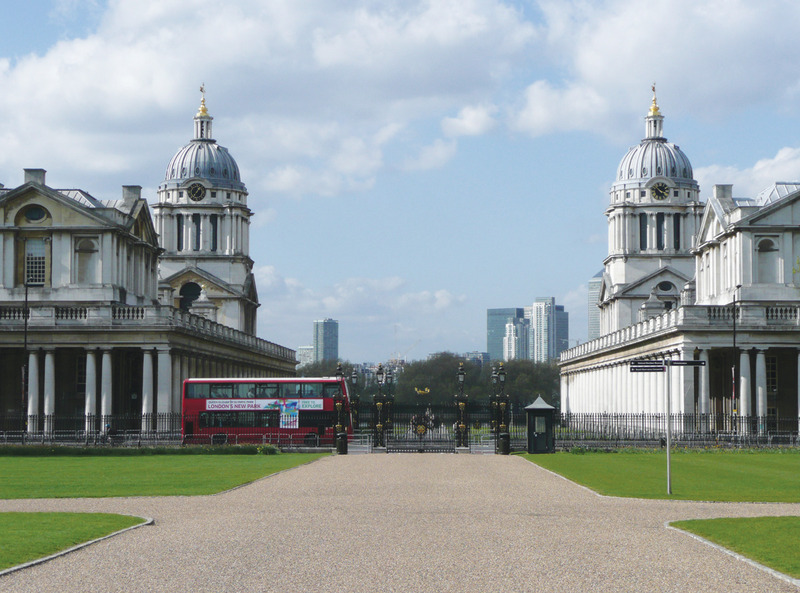 The main buildings are now occupied by the University of Greenwich. With a nod to modern technology, the BBC recently shot a short video of the Painted Hall using a drone aircraft. Opened in 1937, the National Maritime Museum (including the Queen’s House, which is the central part) is the largest of its type in the world, with over 2.5 million items. Most are documents or images for research, but the collection also includes more than 4000 oil paintings, 2500 models, 3300 instruments, 50,000 sea charts, and 100,000 books. The museum is described as “enormously famous,” and includes a collection of portraits second only to the National Portrait Gallery. For sailors like me, the National Maritime Museum holds particular interest. I first visited in 1989 to see the exhibit commemorating the 200th anniversary of the mutiny aboard the Bounty. 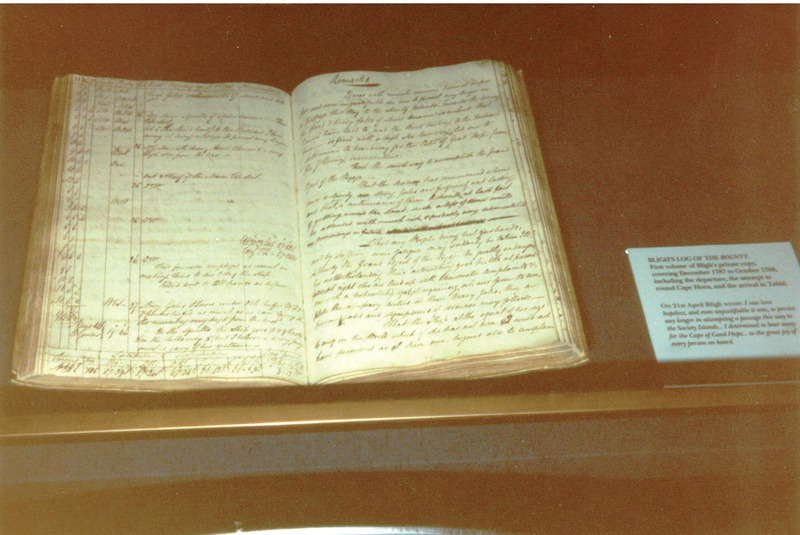 There I saw Captain Bligh’s actual log book and the chronometer that he used for this extraordinary voyage across the Pacific in one of the ship’s longboats. The museums’ website (rmg.co.uk) has listings of current and upcoming events and exhibitions. Along with the replica of that longboat, the museum has more than 100 other boats, most of which are displayed at the National Maritime Museum Cornwall, but the Greenwich ship that demands the most attention is the restored clipper ship, Cutty Sark. The fastest, and last, of the China tea clippers, she was launched in 1869, and after playing a part in the lucrative tea trade and later the Australia wool trade, she came to Greenwich in 1954. 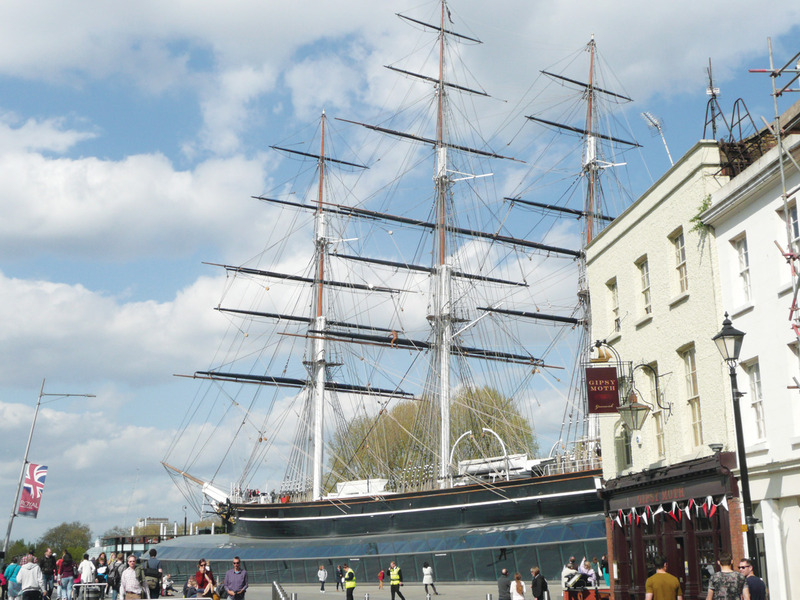 Cutty Sark was restored between 2006 and 2012, when she was placed in her current position. She sits in her dry dock, surrounded by a canopy of glass at the water line, giving her the appearance of being afloat. The hull is raised three metres (ten feet) on a steel frame to show off the gleaming brass sheathed bottom, and a visit aboard reveals that the hull beneath the sheathing is planked with rock elm, with teak planking above the waterline, all fastened to wrought iron frames with brass bolts. Sailors and landsmen alike will appreciate the authentic features of this famous clipper. The other main feature at Greenwich is the Royal Observatory. King Charles II established the position of Astronomer Royal in 1675, with the purpose of accurately mapping the locations and motions of the planets and stars. England wanted this information, along with an accurate seagoing chronometer, in order to improve navigation at sea. John Flamsteed, the first Astronomer Royal, established the Greenwich Meridian, a line of longitude which became the reference for future cartography. The exact location of the meridian was determined with more precision as instruments improved, until it was set at its existing place in 1851 by the seventh Astronomer Royal, George Biddell Airy. Since 1884, time around the world has been referenced to Greenwich Mean Time. Canadians may be interested to see that a statue of Major-General James Wolfe, who captured Quebec City in 1759 and died as a result of injuries incurred in the battle, stands near the observatory. It was a gift of the Canadian people in 1930, and celebrates Wolfe while acknowledging his parents, who lived in Macartney House on the edge of the park. Another curiosity is the Meridian Laser. It is a unique art installment, titled 0 Degrees, by artists Peter Fink and Anne Bean, unveiled at the Observation Building in 1993. 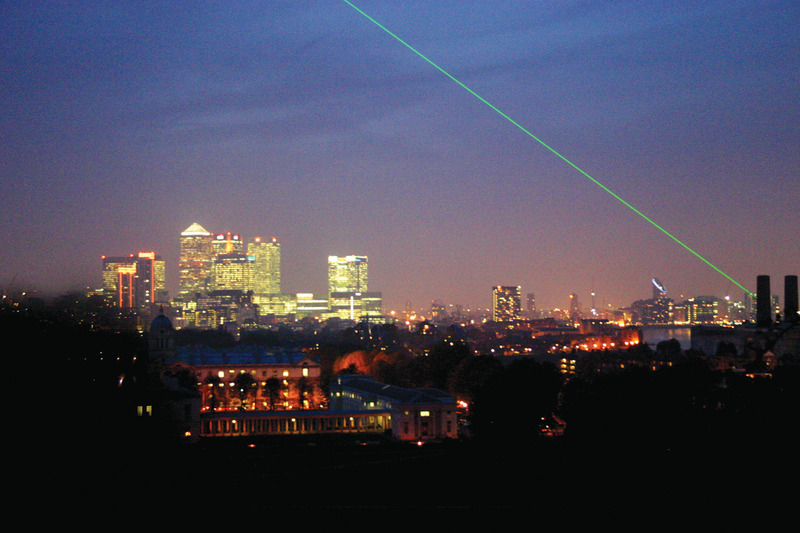 The green laser fires northward along the Greenwich Meridian at night, and is visible with the naked eye from over thirty-six miles away. Before you come to Greenwich, check to see what’s happening at the nearby 02 Arena, the world’s busiest sports and concert venue. It’s also worth exploring the old town to shop and soak up some of the local flavour while you’re here. The Georgian architecture is largely preserved, and the original nautical names of the shops and pubs will give you a glimpse of life in this unique setting.